Porcelain veneers are a simple and safe means to whiten or correct imperfect teeth. Gaps can be closed. Crooked teeth can be straightened. Chips can be mended. Virtually all imperfections can be made perfect again. A porcelain veneer is exactly as it sounds – a thin layer, or veneer, of porcelain bonded to your tooth to close a gap, or to fill a chip. Why Porcelain? Porcelain has the same natural finish and light reflecting characteristics of your tooth’s enamel. It also resists staining, is very durable and can be prepared in any shade to match the natural color of your teeth. Porcelain veneers are used in cosmetic dentistry to whiten stained or discolored teeth. 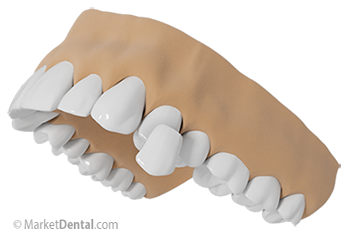 Composed of a ceramic material, veneers are applied to the surface of the teeth. A relatively simple procedure, porcelain veneers take approximately three visits to our office. Minor Imperfections: Porcelain veneers and bonding allow us to correct a smile in as little as three visits. Worn teeth: Teeth wear down as you age. The process can be accelerated if you grind your teeth as well. Porcelain veneers and crowns are ideal for restoring teeth to their youthful, natural size, shape, and color. If you are looking for an experienced dentist in Toronto for porcelain veneers, please give Dayan Dentistry a call at (416) 322-3233 to schedule a consultation with our dentist.